Hundreds of friends and fans in the club scene have rallied to raise funds for DJ A-Dog, aka Andy Williams, since he was diagnosed with leukemia late last year. This Friday at the South End Art Hop, a pair of artists steps up. And if all goes well, so will one or more patrons, at an auction for a set of six acrylic works on 3-by-3-foot panels created over the past few weeks by Scott Campbell and Brooklyn-based Jay Giroux. Actually, the final three layers — of eight that make up the paintings — will be applied live before the auction outside Black Horse Fine Art Supply on Pine Street. The brightly colored panels melding urban and floral motifs were inspired, Giroux says, by the personalities of A-Dog and his girlfriend, Josie Sourdiffe. “I’d love to get $5000 for the whole thing,” says Giroux in an interview at his second-floor studio above Black Horse. The artist, who arrived this summer to assist his mother following an operation, has been working on the mixed-media pieces for the benefit and a number of other drawings and paintings. He’s been getting caught up on the Burlington scene, too, meeting Black Horse owner John Bates, and such kindred-spirit artists as Campbell and Clark Derbes. Born and raised here until age 13, Giroux, now 34, lived in Tampa, Fla., before heading to the University of Houston for an MFA in painting. He describes the program as an eye-opening experience. From “going in circles, not sure what I was doing,” Giroux ventured into a tony art world shaped and fueled by serious money — as he puts it, “rich oil guys whose wives started teaming up and creating an art infrastructure,” including galleries, museums and collectors. Neither of those descriptions, of course, gives a clue to how Giroux constructs his surprisingly complex works — think taping, stripping, scraping, painting and sometimes collaging. 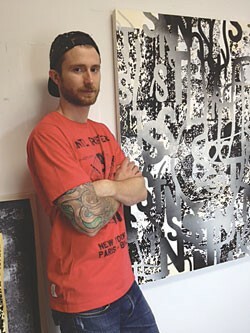 The artist is happy to talk about both the mechanics of and concepts behind his art. Case in point: one of the works now hanging in his temporary Burlington quarters, a 39-by-49-inch acrylic-on-canvas painting titled “Mostly Ts, Ns, and Ss.” Dramatically rendered in austere black and gray, the work was produced in multiple layers, giving it fathomless depth. One of the layers is a scattering of patterned discs Giroux created with a lino block he found at ReSource. The decorative, rubber-stamp look of the disc makes it less likely a viewer will pick up on Giroux’s own reading of its pattern as occult. “For whatever reason, I’ve tapped into that magical, occult, hedonistic gypsy culture,” he says. But a viewer might look at this painting for a long time without getting that impression, or grasping that the curvy typographic overlay of the titular “Ts, Ns, and Ss” draws its letters from the word Satan. If the previous turnout for A-Dog fundraisers is any indication, Giroux and Campbell should find an affirmation from the visual-arts community, too. Live painting by Scott Campbell and Jay Giroux, followed by art auction, on Friday, September 6, 6 to 10 p.m. at Black Horse Fine Art Supply, 277 Pine Street, Burlington.